If you’re ready to throw out the rule book and return as much as you can to the soil, Compost Everything is the book for you. It’s time to quit fighting Mother Nature and start working with her to recycle organic matter and create lush and beautiful gardens with some of the most extreme composting techniques known to Man! get rid of unwanted bodies. 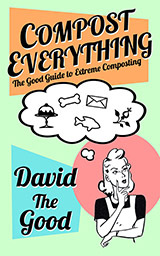 Learn to compost like you’ve never composted before with the first book in the Good Guide to Gardening series, by expert gardener and master composter David the Good. This book is a DRM-free EPUB. To convert to AZW, MOBI, or any other file format, please utilize Calibre.